Keywords: Inpatients. Alcohol Withdrawal. Psychotic Disorders. Rehabilitation. Key messages: Quality of life (QOL) in patients with alcohol dependence syndrome is significantly poor and in consideration of chronic relapsing nature of the disorder, if interventions are focussed on the betterment of these along with course of the treatment and rehabilitation, patients and families may be benefited more. Alcohol use disorders (AUDs) are chronic disorders with varying periods of abstinence and relapse which are common despite treatment. This causes fluctuations and instabilities in the life of the affected individuals in physical, psychological, and socio-occupational aspects which directly or indirectly affects the wellbeing of the individual. The life time risk for alcohol dependence is approximately ten to 15 per cent for men and three to five per cent for women, with one year prevalence rates of about six per cent. The peak ages of onset of dependence are from the early 20s to about the age of 40. A World Health Organization (WHO) report states that alcoholism ranks first in causing highest DALYs (Disability Adjusted Life Years) of about 44,000,000 in middle income group of nations. Prevalence of alcohol use and alcohol dependence in India is varied but the National Health Survey 2004 showed it to be around 21.4%. Of the total alcohol-users, 17% (which amounts to 10.6 million dependent users according to population of 2001 population survey), were classified as dependent users based on the International Classification of Diseases (ICD)-10 criteria. The recent National Family Health Survey has found that the alcohol consumption in adult men of age group 15-49 years is 29.3 per cent in Karnataka (whereas national average is 29.2%). 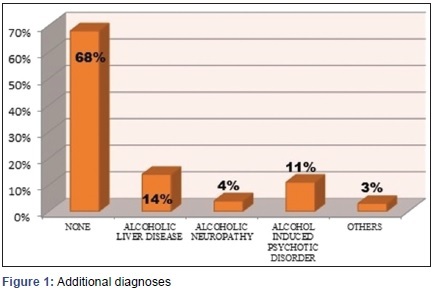 The recently concluded National Mental Health Survey reported that the prevalence of alcohol use disorders is 4.65%. Quality of life (QOL) is a broad ranging concept incorporating an individual’s physical health, psychological state, level of independence, social relationships, personal beliefs, and relationship to salient features of the environment. They coincide with the treatment goal of enhanced client functioning and predict treatment adherence. Some evidence suggests that QOL has prognostic value in treatment settings; for example, higher pre-treatment QOL predicts better outcomes in inpatient psychiatric units, independent of baseline psychiatric status and other relevant factors. QOL may influence the odds of symptom reduction. QOL measures can greatly assist clinicians in selecting and assessing the effectiveness of a specific course of treatment. Their use is in keeping with a growing interest throughout the health field in models that engage patients as partners in their own care. The nature of substance use disorder (SUD) makes consideration of QOL, particularly O-QOL (Overall QOL, apart from the other type H-QOL [Health-related QOL]), highly relevant as, active substance abuse affects nearly all areas of functioning: vocational, social/familial, physical and mental health, residential status, and access to services. In addition to concern about remaining abstinent, participants at all stages of recovery expressed concerns about multiple areas of functioning—most notably, employment, education and training, and housing. Although abstinence from drugs and alcohol was traditionally considered a proxy for good function in other areas, that assumption no longer holds. To the contrary, abstinence rarely brings instant relief from all other problems in life. With the growing awareness and emergence of client-centred approaches, the concept of ‘recovery’ is being revised. The Substance Abuse and Mental Health Services Administration (SAMHSA) defines recovery as “a process of change through which an individual achieves abstinence and improved health, wellness and quality of life”. A review of QOL research on patients with alcohol dependence syndrome (ADS) states that QOL of alcohol dependent subjects is very poor but improved as a result of abstinence, controlled or minimal drinking. The important factors in QOL of alcohol dependent subjects are psychiatric comorbidity, social environment, and disturbed sleep. With such a considerable amount of problem, there are very few studies done on assessing QOL in patients with ADS with internationally standardised instruments. Foster et al. reviewed QOL in alcohol dependent subjects and noted the paucity of papers in QOL research. Knowing about QOL of alcohol dependent patients may help to frame policies for their treatment, rehabilitation, and control of alcohol use, and improve QOL for this huge population of hopeless patients. In this background, this study is aimed at assessing QOL in patients with ADS and where to focus the interventions for the betterment of these along with course of the treatment and rehabilitation. To know about QOL in patients with ADS. 1. To assess QOL in patients with ADS. 2. To study the relationship between sociodemographic and clinical variables with QOL. This study was a cross-sectional descriptive study. It was conducted in department of psychiatry of Basaveshwara Medical College and Research Centre, Chitradurga, Karnataka, India. Study period was from October 2013 to October 2014. Institutional ethics committee clearance was taken. One hundred consecutive admissions were included into study after informed consent was taken. Data about sociodemographic profile of these patients was collected in a semi-structured proforma, and data regarding comorbid psychiatric and medical conditions were noted. Each patient was administered the Mini-International Neuropsychiatric Interview (MINI Plus 5.0) and the Alcohol Use Disorders Identification Test (AUDIT). Once patient was fit for detailed interviewing, they were administered the World Health Organization Quality of Life assessment instrument-brief version (WHOQOL-BREF). Some of the information were also collected from patients’ attendants. 1. Persons aged between 18 and 65 years. 2. Those who fulfilled the criteria for ADS as per the diagnostic guidelines mentioned in ICD-10. 3. Patients who were able to give valid informed consent. 1. Primary axis-I psychiatric disorders. 2. Patients with major medical problems. 3. Patients with any other disabilities. WHOQOL-BREF is an abbreviated 26-item version of the WHOQOL-100 containing items that were extracted from the WHOQOL-100 field trial data. WHOQOL-BREF contains one item from each of the 24 facets of QOL included in the WHOQOL-100, plus two ‘benchmark’ items from the general facet on overall QOL and general health (not included in the scoring). It contains four domains: physical, psychological, social relationships, and environment. The scores are transformed on a scale from zero to 100 to enable comparisons to be made between domains composed of unequal numbers of items. Internal consistency measured by Cronbach’s alpha score are high: 0.82 (domain one), 0.81 (domain two), 0.68 (domain three), and 0.80 (domain four). Analyses of internal consistency, item-total correlations, discriminant validity and construct validity through confirmatory factor analysis indicate that WHOQOL-BREF has good to excellent psychometric properties of reliability and performs well in preliminary tests of validity. These results indicate that overall WHOQOL-BREF is a sound, cross-culturally valid assessment of QOL. In this study, WHOQOL-BREF version was administered which has 26 questions distributed among four domains as mentioned earlier. Scores from this version is obtained and transformed to the full version of WHOQOL which is comparable across populations. Scores were arranged in a scale of zero to 100 and lower the scores, poorer the quality of life. By applying tests of normality among variables, it was found that many variables do not follow normative distribution and hence to study the strength of association between various variables, non-parametric tests of correlation using Spearman’s rho test was run using SPSS 19. Further, sample is divided into comparable groups based on age of onset of dependence, family history of ADS, simple and complicated withdrawal, additional diagnosis patients received, and comparisons were made in alcohol-related variables and QOL score among these groups using non-parametric tests, i.e. Mann-Whitney-U tests for independent samples and Kruskal-Wallis test (which is the non-parametric analogue of an one-way analysis of variance [ANOVA]). Correlation coefficient (r) values of ≥0.3 are considered to be statistically significant and are reported. Table 1 shows the sociodemographic and alcohol use details. Sample was predominantly male with only six per cent females enrolled in the study. Seventy four per cent of the patients were currently married, eight per cent were separated from their spouses, and two per cent each were divorced and widowed. Most subjects remained married with ADS indicating good family support. Sixty six per cent were hailing from urban background. Twenty six per cent of the patients were unskilled labourers, 24% were semiskilled labourers, and 18% of the patients were unemployed at least during last one month. Whiskey was reported to be the drink of their choice by most of the patients in this study, accounting to 73% of the patients. About 31% patients had history of withdrawal seizures including the present withdrawal. One-third of the patients having withdrawal seizures indicated that this was the cause of seeking treatment. About 41% patients had previous de-addiction treatment before the current one. This indicated that relapses were common. About 19% patients had history of attempted suicide. Seventy eight per cent of the patients had family history of alcohol dependence in first degree relatives indicating high genetic background. Seventy per cent of the patients presented with uncomplicated withdrawal, 18% with delirium, ten per cent with delirium and seizures, and two per cent with seizures without delirium. Figure 1 shows distribution of additional diagnoses. Additional diagnoses were those related to or induced by alcohol and not by any general medical condition which may have differentially contributed to QOL. These were diagnosed after detailed clinical, laboratory work-up, and liaison with appropriate medical specialty. Sixty eight per cent of patients did not have any additional diagnoses. Patients scored lowest on physical domain (33.95, SD 11.39) followed by psychological domain (37.84, SD 12.62) which is comparable to social relationships domain (39.92, SD 16.96) and highest on environment domain (50.34, SD 11.94) (Table 2). Total family income is positively correlated to better scores on environment domain of WHOQOL-BREF which means higher the family income, better is the QOL in environment domain. Amount of alcohol used is inversely correlated to physical domain of WHOQOL-BREF. 1. Onset of alcohol dependence into early and late onset groups based on the Cloninger typology. 2. Type of withdrawal based on ICD-10 into complicated and uncomplicated withdrawal. 3. Additional clinical diagnoses received along with ADS which were related to alcohol as causal role. When groups were divided into early and late onset, based on the typology proposed by Cloninger et al., there existed significant differences between groups (Table 3). There existed no statistically significant differences between WHOQOL scores of early and late onset dependence groups (Table 4). Complicated withdrawal group included delirium, delirium with seizures, and with seizures alone. On comparing WHOQOL-BREF scores among uncomplicated withdrawal and complicated withdrawal groups, statistically significant difference was found only in physical domain with complicated withdrawal having poorer QOL (Mann-Whitney U score 598.00 at the significance level of 0.01 with p value 6.46×10-4). On comparing WHOQOL-BREF scores among additional diagnoses group, statistically significant difference was found only in psychological domain with transformed score of 25.5 (±13.85) in alcohol-induced psychotic disorder (Kruskal-Wallis chi-square value 6.098 at the significance level of 0.0 with p value 0.047). QOL is a dynamic index which is perceived wellbeing of an individual. It can be affected by various factors including physical, emotional, social, and spiritual aspects of an individual. Some of the following sociodemographic indices and alcohol-related variables in the study needs to be considered in relation to QOL assessment. Mean age of the study sample was 39.08 years. The mean age at onset of first drink is 21.6 years and onset of dependence pattern is 26.7 years. A mean gap of 5.1 years is present in patients of this study for the development of dependence. The average monthly family income was 8580 rupees out of which an average of 147.8 rupees per day which amounts to 4434 rupees per month was spent on buying alcohol which accounts to 51.7% of the total family income. Mean alcohol use in pure ethanol equivalents is 214 g/day (SD 76.8 g) which roughly equals to around 540 ml of distilled spirits. AUDIT results reveal that 91% of patients had taken alcohol more than four times a week. This correlates to considerably higher intake and higher AUDIT scores signifying severe ADS. Thirty per cent of subjects had complicated withdrawal and 32% had at least one additional diagnosis. All these indices directly or indirectly can affect QOL in all four domains as they tend to upset physical and psychological health and financial state of the patient and family as well. QOL in ADS has been measured in different parts of the world and conditions using scales like WHOQOL and SF-36 across various domains. Some of the similarly conducted studies are mentioned in Table 5 and discussed in comparison with our study. In WHOQOL scale, lower the scores, poorer will be QOL. At the outlook, there is high variability among scores; but, the trend is generally poorer QOL in studies with inpatient and samples with severe ADS. In our study, patients scored lowest on physical domain (33.95, SD 11.39) followed by psychological domain (37.84, SD 12.62) which is comparable to social relationships domain (39.92, SD 16.96) and highest on environment domain (50.34, SD 11.94). Table 5 shows a comparison of important studies on QOL in ADS in different parts of the world using WHOQOL instrument. Psychological and social relations domains tend to be poorer in all studies except our study and the Greek study, indicating the difficulty in emotional, cognitive, and behavioural aspects in patients. Poorer scores on physical domains correspond to impaired mobility and ability to work. Environmental domain scores are consistently higher across the studies indicating better satisfaction with living setup and access to health. The South American study for validation of WHOQOL-BREF in patients with ADS has stratified QOL among severity of alcohol and it compared scores with the Health Survey-Shor Form (SF-36). Also, SF-36 scores were lower in mental health, social function, role emotional, and role physical domains which corresponds to the above domains. WHOQOL scores in the above study from severe ADS are more comparable to the patients in this study which also involves severe ADS as reflected by high AUDIT scores. There are no wide variations in each domain in the above study but in our study, physical domain is much poorer while environmental domain fares higher in QOL. Differences again may be due to inclusion of more severe ADS patients in our study and higher ratio of early onset and long duration of users reflected by higher AUDIT scores in our study. In a study done in France, QOL of alcohol dependent subjects is reduced compared with that of a normative healthy population, with differences between genders (QOL poorer for women). As regards to SF-36, the role limitation and psychological functioning scores are lower than those of physical and functioning dimensions, and handicap is most important in physical and emotional role limitations, and social functioning. Psychiatric comorbidities, especially depression, disturbed sleep, and social problems are major factors linked to QOL. In comparison with our study, only the subgroup of alcohol-induced psychotic disorder had statistically significant lower scores on psychological domain. Another Indian study assessing change in QOL after brief intervention has used WHOQOL-BREF in patients with AUDs. It includes less severe ADS patients wherein AUDIT scores are from eight to 24. Physical mobility to the contrast from present study is higher in quality whereas psychological domain is the most affected one. To summarise the discussion, by comparing various other studies which have used similar instruments and settings, the results from this study revealed poorer QOL at least in the past month before seeking treatment. Poorer QOL is probably due to admission of patients with much higher severity of dependence, longer duration of use, younger age of onset and rapid development of dependence, lower income, and a higher proportion of income being spent in alcohol leaving with consequences. By excluding other substance dependence, axis-I psychiatric illnesses and medical illnesses, especially chronic medical illnesses, the major confounding factors for alcohol use-induced disabilities are thus avoided; so that, actual reflection of QOL, exclusively induced by alcohol dependence could be reliably assessed. Use of MINI in screening out psychiatric syndromes can be justified here. Use of WHOQOL-BREF which is internationally validated and has been studied widely in the field of SUDs across the world and validated across various population groups. The results so obtained can be compared with normative population data and thus, can be compared to normal population groups also. Interviewer version of the instruments is used to avoid reporting biases by patients who are distributed widely among different socioeconomic and educational background. It is a cross-sectional, single site, one time evaluation study which measures indices only in past 30 days. Population sample in this study may not actually represent the general population as it is done in a metropolitan city where rural representation tends to be lesser and a higher educational and economic status may be present. Inpatient de-addiction centre tends to have an enriched sample of more severe ADS patients who tend to have more suffering, poorer QOL and thus, the outcome may have highlighted one extreme of ADS population and may look exaggerated when overall picture in other studies are taken into comparison. This may be the reason as well for under-representation from female population, though many studies have reported substantial amount of female patients with ADS. Recall bias during the past 30 days, particularly those who score poorer on cognitive domains, may have been present, though the duration is less and interview is conducted after clinical stabilisation and when the patient is fit. Other significant conditions such as personality traits and disorders, adult ADHD (attention deficit hyperactivity disorder), patients with dull normal to borderline intelligence, sub-syndromal psychiatric disorders that could not be reliably screened out using MINI and thus, not excluded from the study which may have contributed to poorer outcome measures. Of particular interest, the first two conditions which are reported to be in a substantial numbers in AUDs especially in early onset group who constitute 49% of our study sample. These potentially contribute to poorer QOL, maintenance and relapses of alcohol dependence. Further studies that would attempt to exclude these reliably may refine the results. Patients with ADS have poor QOL. Age of onset of first drink and onset of dependence, amount of alcohol consumed influence QOL. Complicated withdrawal group has poorer QOL than that of simple withdrawal group. 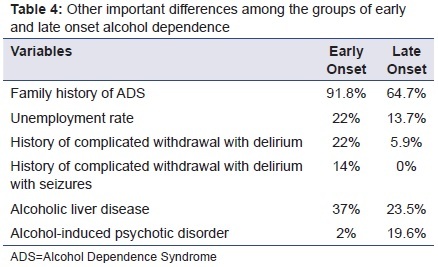 Medical and psychiatric complications of alcohol impoverish QOL. Further studies which incorporate wider samples with follow-up, intervention, comparative groups, blinding of interviewer, and including more accurate measures of alcohol dependence severity indices would give a more accurate measure of associated QOL. Measuring QOL in alcohol dependent patients would help in devising better rehabilitation programmes with individualisation and also governmental policies in improving care, productivity, and reducing the burden of the disease on society. Schuckit AM. Alcohol-related disorders. In: Sadock J, Sadock VA, Ruiz P, editors. Kaplan & Sadock’s comprehensive textbook of psychiatry. 9th ed. Philadelphia: Lippincott Williams & Wilkins 2009:1268-70. Gururaj G, Varghese M, Benegal V, Rao GN, Pathak K, Singh LK, et al. National Mental Health Survey of India, 2015-16: prevalence, patterns and outcomes. Bengaluru: National Institute of Mental Health and Neuro Sciences, NIMHANS Publication No. 129; 2016. Smith KW, Larson MJ. Quality of life assessments by adult substance abusers receiving publicly funded treatment in Massachusetts. Am J Drug Alcohol Abuse. 2003;29:323-35. Rudolf H, Priebe S. Subjective quality of life and depressive symptoms in women with alcoholism during detoxification treatment. Drug Alcohol Depend. 2002;66:71-6. Laudet AB, Becker JB, White WL. Don’t wanna go through that madness no more: quality of life satisfaction as predictor of sustained remission from illicit drug misuse. Subst Use Misuse. 2009;44:227-52. McLellan AT, Chalk M, Bartlett J. Outcomes, performance, and quality: what’s the difference? J Subst Abuse Treat. 2007;32:331-40. Center for Substance Abuse Treatment. National summit on recovery: conference report. Rockville, MD: Substance Abuse and Mental Health Services Administration; 2006. Foster JH, Powell JE, Marshall EJ, Peters TJ. Quality of life in alcohol-dependent subjects--a review. Qual Life Res. 1999;8:255-61. Sheehan DV, Lecrubier Y, Sheehan KH, Amorim P, Janavs J, Weiller E, et al. The Mini-International Neuropsychiatric Interview (M.I.N.I. ): the development and validation of a structured diagnostic psychiatric interview for DSM-IV and ICD-10. J Clin Psychiatry. 1998;59 Suppl 20:22-33;quiz 34-57. Babor TF, DeLaFuentes JR, Saunders J, Grant M. AUDIT. The Alcohol Use Disorders Identification Test: guidelines for use in primary health care. World Health Organ. 1992;PSA/92.4:1–30. World Health Organization. The ICD-10 classification of mental and behavioural disorders: diagnostic criteria for research. Geneva: World Health Organization; 1992. Skevington SM, Lotfy M, O’Connell KA; WHOQOL Group. The World Health Organization’s WHOQOL-BREF quality of life assessment: psychometric properties and results of the international field trial. A report from the WHOQOL group. Qual Life Res. 2004;13:299-310. Cloninger CR, Bohman M, Sigvardsson S. Inheritance of alcohol abuse. Cross-fostering analysis of adopted men. Arch Gen Psychiatry. 1981;38:861-8. Philip G, Greg W, Khelifa NA. Quality of life and disability in alcohol and drug dependent patients undergoing treatment at Depaul House. IeJSME 2007:1:35-40.
da Silva Lima AF, Fleck M, Pechansky F, de Boni R, Sukop P. Psychometric properties of the World Health Organization quality of life instrument (WHOQoL-BREF) in alcoholic males: a pilot study. Qual Life Res. 2005;14:473-8. LoCastro JS, Youngblood M, Cisler RA, Mattson ME, Zweben A, Anton RF, et al. Alcohol treatment effects on secondary nondrinking outcomes and quality of life: the COMBINE study. J Stud Alcohol Drugs. 2009;70:186-96. Pal HR, Yadav D, Mehta S, Mohan I. 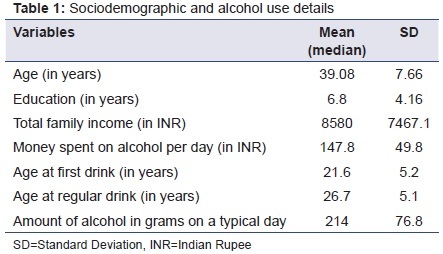 A comparison of brief intervention versus simple advice for alcohol use disorders in a North India community-based sample followed for 3 months. Alcohol Alcohol. 2007;42:328-32. Ginieri-Coccossis M, Liappas IA, Tzavellas E, Triantafillou E, Soldatos C. Detecting changes in quality of life and psychiatric symptomatology following an in-patient detoxification programme for alcohol-dependent individuals: the use of WHOQOL-100. In Vivo. 2007;21:99-106. Ware JE, Brook RH, Davies AR, Williams KN, Stewart A, Rogers WH, et al. Conceptualization and measurement of health for adults in the Health Insurance Study: vol. I, model of health and methodology. Santa Monica, CA: Rand; 1980. Malet L, Llorca PM, Beringuier B, Lehert P, Falissard B. AlQoL 9 for measuring quality of life in alcohol dependence. Alcohol Alcohol. 2006;41:181-7. Chikkerahally GDMD. Assessment of quality of life in patients with alcohol dependence syndrome. Open J Psychiatry Allied Sci. 2019;10:57-63. doi: 10.5958/2394-2061.2019.00014.4. Epub 2018 Dec 4.